This study aimed to investigate the effects of several clinical factors on the success and survival rates of multiple-visit non-surgical root canal (NSRC) retreatment. 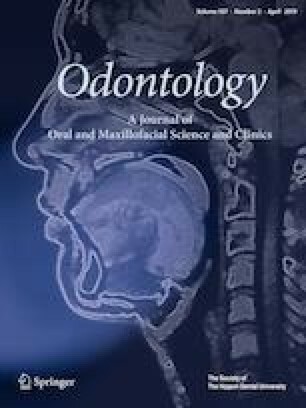 Failed endodontically treated 236 teeth in 161 patients (18–72 years, 48% males; and 52% females) were retreated between March 2014 and December 2015 and were enrolled in this study. Two calibrated examiners evaluated the preoperative, intraoperative, and postoperative outcomes using the periapical index (PAI) scores. The teeth were classified as healed (healthy apical tissues, PAI ≤ 2, no signs or symptoms), healing (no signs and symptoms, PAI > 2 but reduced from the initial PAI score), and not-healed (presence of apical periodontitis, signs and/or symptoms, PAI > 2). The teeth scored as healed and healing was considered to be successful, while the not-healed ones were considered as failures. Of the 236 teeth, 135 (57.3%) in 103 patients (63.9%) were lost to follow-up, yielding to follow-up of 101 teeth (42.7%) in 58 patients (36%). Three teeth were extracted yielding to an overall success rate of 85.1%, at a mean observation time of 33.8 months. The teeth with periapical lesions < 5 mm had an 88.6% success rate, while those ≥ 5 mm had an 80% success rate (P > 0.05). While, age, gender, preoperative, intraoperative, and postoperative factors did not significantly affect the outcomes (P > 0.05), tooth type significantly affected the success rate (P < 0.05). The most frequently failed teeth were the mandibular first molars (P < 0.05). Based on these results, the multiple-visit NSRC retreatment exhibited a favorable success rate and could be offered for the endodontically failed teeth. This study was not supported by any funding source.